Fansipan View hotel is one of those great finds, located up a quiet alley way so there is no traffic noise, but it is close to markets and all the Sapa attractions, 100m far from the Church; a nice boutique hotel with 15 tasty rooms. 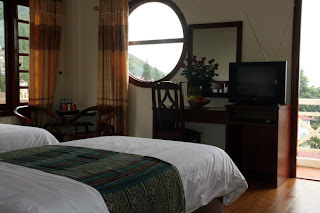 The hotel occupies an unprecedented location overlooking the valleys of Sapa and the imposing Fansipan Mountain. Fansipan View stands out with its boutique interiors, attentive personalised customer service and incomparable value for money. 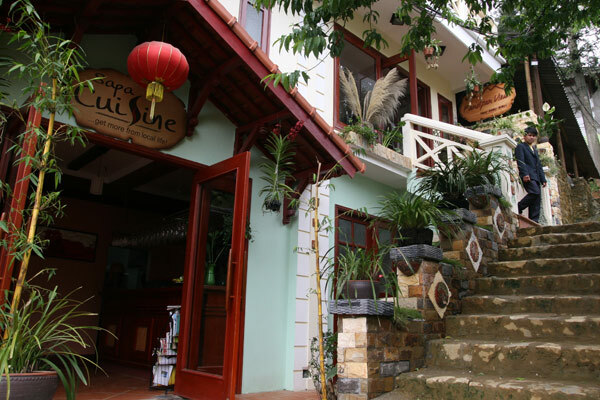 This French-style building has been lovingly refurbished to assure an unforgettable and truly authentic Sapa experience. Designed for the discerning traveller, our superior rooms are a haven of simple style and comfort with many extra details. Each of our superior rooms has been thoughtfully designed with original paintings and artwork, furnished to create a memorable stay. Our 7 rooms are comfortable and practical, equipped with beautiful private bathrooms. All rooms have wooden floor, some with balcony and view to the Dragon Jaw Mt. Our Deluxe rooms are 26 square meters of luxury and comfort with the spectacular view to the town and the Fansipan Range. 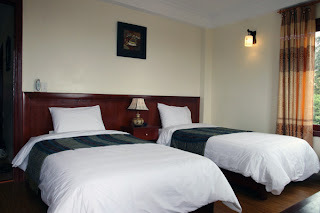 Each Deluxe room has large ensuite bathroom with shower and bath-stup, one queen size bed with the option for extra beds. Our Deluxe rooms have been thoughtfully designed with original paintings and furnished to create a memorable stay. All rooms have wooden floor, balcony, opened for fresh air in Summer and are heated in Winter time. Cancellation: Free! If cancelled up to 2 days before date of arrival, no fee will be charged.